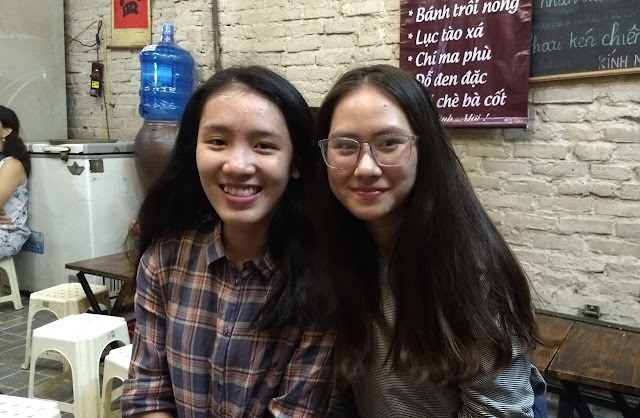 HanoiKids is a great organization that pairs visitors up with local Hanoi University students for cultural and food tours. The visitors get a tour by knowledgeable local guides, and the students get a chance to practice their English and show off their beautiful city - everyone wins. 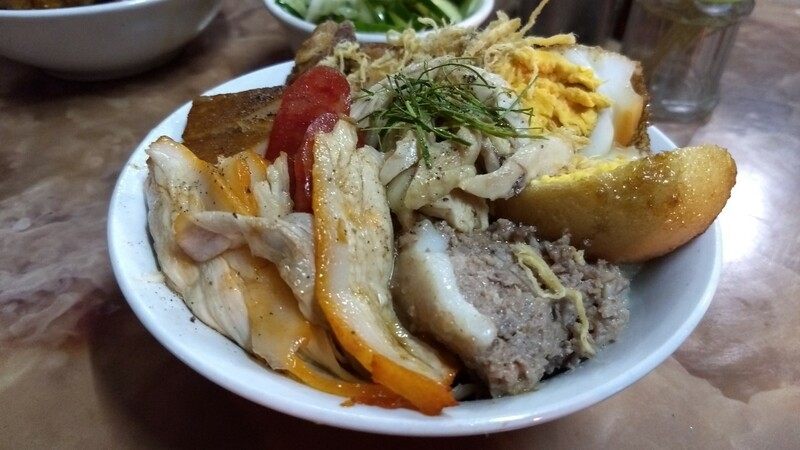 Our guides were Nga and Yen, and they took us on a fun, informative and delicious food tour in Hanoi's Old Quarter. 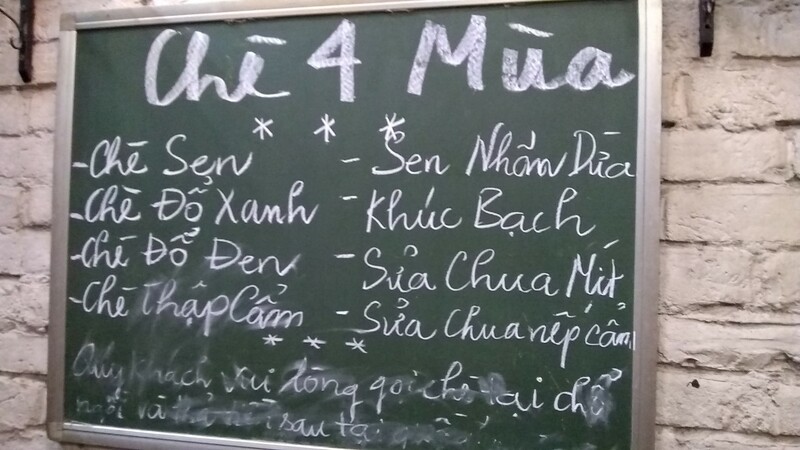 Our first dish was Xôi (sticky rice). The stand was just down the street from our hotel, but we probably never would have stopped there without Nga and Yen's guidance. 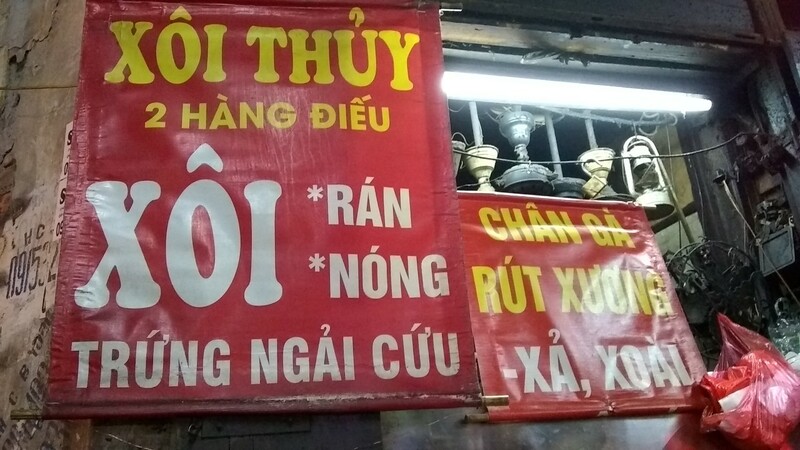 The rice is served either "hot" (Nóng) or "fried" (Rán). We had the hot version - a bowl of sticky rice hot out of the steamer and flavored with savory stock before being stacked with a variety of tasty toppings. You can choose what kind of toppings you like. 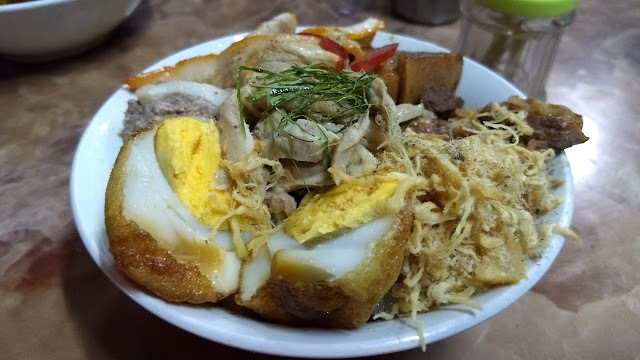 We had a bit of everything - egg (with a bit of fried coating on the outside), a few kinds of sliced pork, pork floss, pâté, Chinese-style sausage, and likely some other bits I'm missing. Every bite of it was really good. We ended up coming back here and having the exact same thing a few days later. Next up was a stewed, "medicinal" chicken soup with noodles. The soup stock and the chicken were both black, and the flavor definitely had a bit of a medicinal quality. This was accentuated by the greens - mugwort - which were decidedly bitter, but enjoyable. 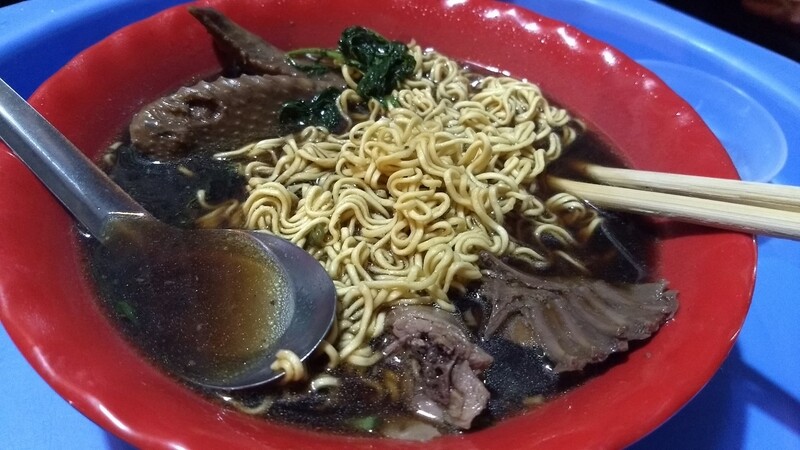 The noodles were like a ramen and came as a block on top of the soup, quickly softening. 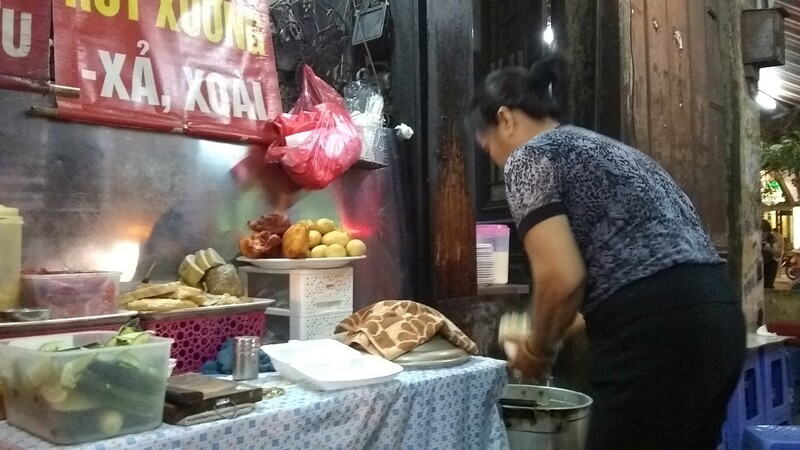 Our third stop was at a Chè ("sweet soup") shop. 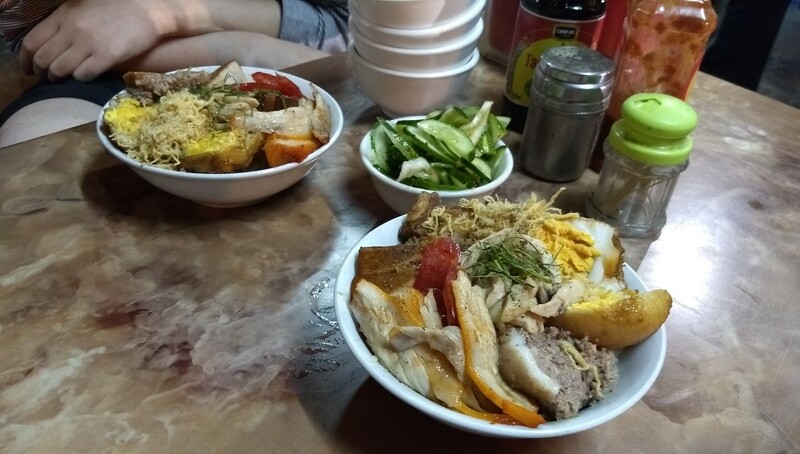 Our tastes run more to the savory, so this is something we probably would not have tried without the tour and we liked it more than we expected. We tried three different kinds. The one pictured above was probably my favorite - a refreshing bowl of slightly sweet coconut jellies. 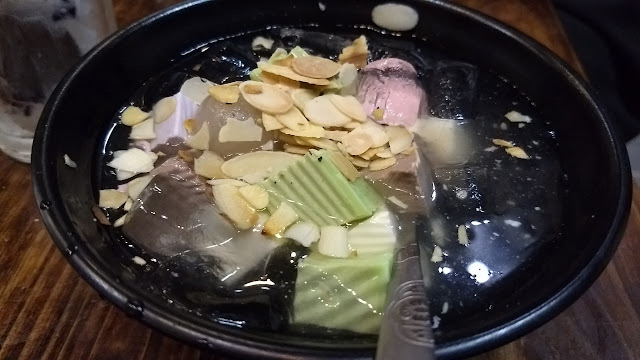 The one above on the left had black bean, mung bean, lotus seeds and jellies (and some other stuff). 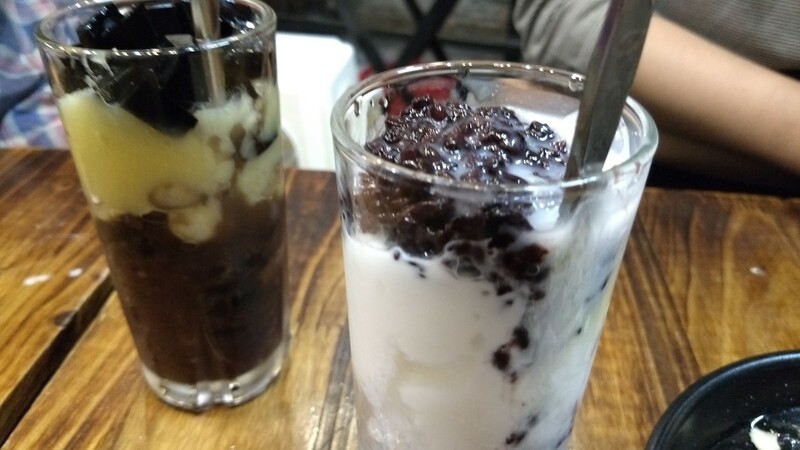 The one on the right was simpler - black rice and yogurt. The menu is below, but I'm currently at a loss to pick out which ones we had. Our last stop was at a little shop for coconut coffee. 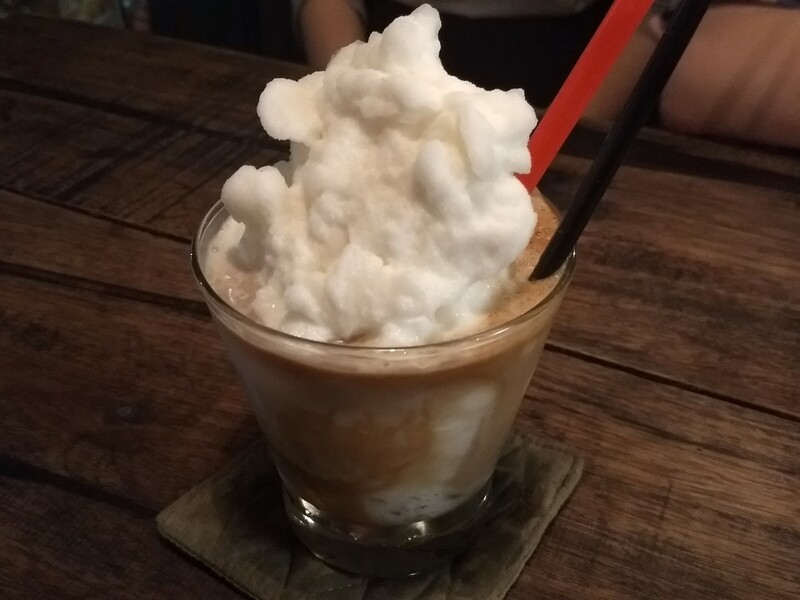 This was a soft, lightly flavored mountain of coconut ice resting in rich coffee. Spoonfuls of the ice dipped into the coffee made for a very refreshing way to end the evening. 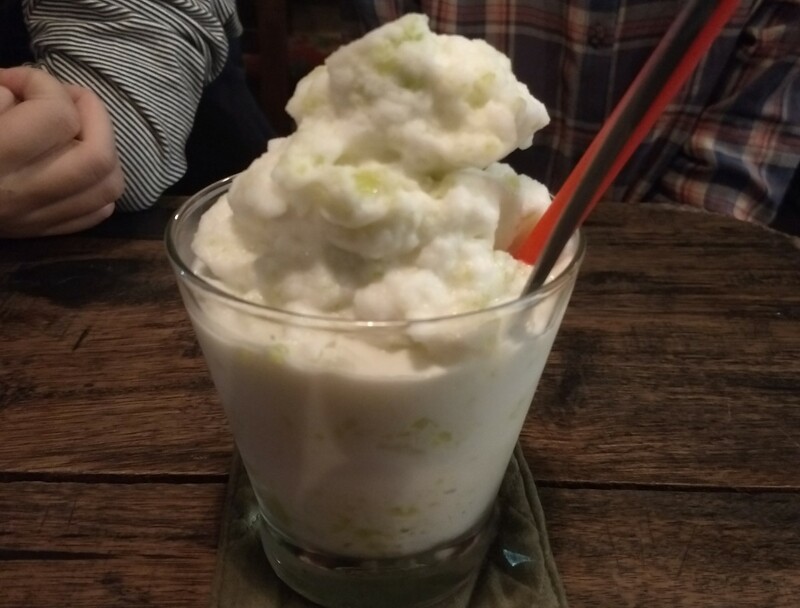 We also tried another one - this time flavored with green sticky rice. Overall, we had a very nice and tasty evening. A big thank you to our guides Nga and Yen from HanoiKids!